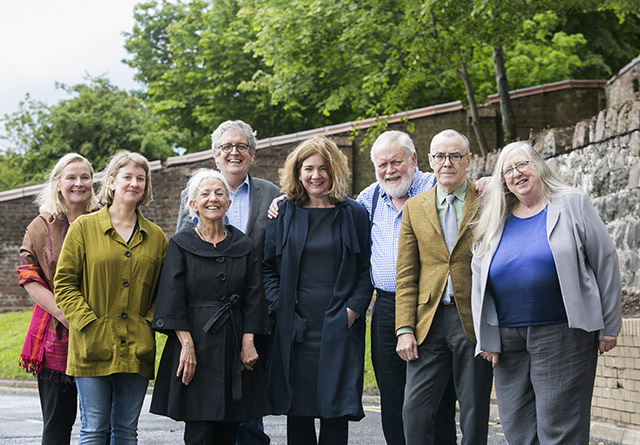 Image: Pictured are: Noirin McKinney (Arts Council) and Fran Brearton (Queen’s University Belfast), with Leontia Flynn, Paula Meehan, Gerry Dawe, Michael Longley, Ciaran Carson and current Ireland Chair of Poetry Eiléan Ní Chuilleanáin. Leading poets from across the island of Ireland were called together to discuss the appointment of an International Visiting Poetry Fellow, as part of the Arts Council of Northern Ireland’s and Queen’s University Belfast’s joint ten-year Seamus Heaney Legacy project. The bursary, awarded annually and worth £20,000, will be made to a distinguished poet of international repute, to travel to Northern Ireland where they will be based for several weeks in the autumn of each year. The selection panel comprises poets Ciaran Carson, current Ireland Chair of Poetry Eiléan Ní Chuilleanáin, Gerald Dawe, Leontia Flynn, Michael Longley and Paula Meehan, plus Professor Fran Brearton, representing the Seamus Heaney Centre for Poetry, and Nóirín McKinney from the Arts Council. Nóirín McKinney, Director of Arts Development, Arts Council of Northern Ireland, commented: “We are honoured to be joined today by some of the most respected poets of several generations to begin the process of selecting an International Visiting Poetry Fellow. It is our hope that the first recipient will take up their post in Autumn 2018 and after that, an appointment will be made annually for five years. Today’s announcement follows the appointment of Myra Zepf as Children’s Writing Fellow last month. Both appointments form part of a wider project of work devised by Queen’s University of Belfast and the Arts Council in honour of Seamus Heaney and his contribution to literature. The appointment of the 2018 fellow will be announced by the end of this year.